Parents often feel an insurmountable communications barrier is developing between themselves and their teens. There’s frequently an inclination to ignore it and put it down to ‘just a phase’ the teenager is going through. Alternatively, some parents in sheer desperation tackle such issues head on, in what can appear to the teenager to be a confrontational or accusatory approach. The fact is that many parents feel undermined and threatened when teens fall inexplicably silent; it signifies a loss of control over their child, and a beginning to going separate ways. When a teen isn’t sharing what’s going on in his or her world anymore, parents feel shut out. Beyond this, however, the suspicious parent often believes the insular teen must have something to hide. However, it should be remembered that many teens themselves are struggling inwardly too; it’s not often about deliberately alienating parents and elders, or concealing something. Your teens are probably trying to work out who they are and how they fit into peers, the family and society as a whole. 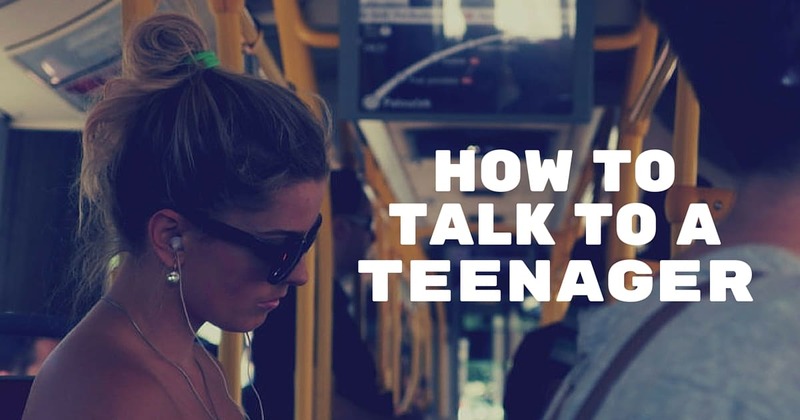 Talking to teens in a gentle manner and via methods they understand, should help. How do teenagers communicate with each other much of the time? They often elect to use social networking sites — especially Facebook — even if their friend is readily accessible for a real, face-to-face conversation. Texting, too, is popular; teens text each other even when sitting next to each other in class or standing several feet away in the school yard. They text when they’ve only just said goodbye at day end. It may all seem unfathomable to adults, but if your teens feel most at ease communicating in these ways then don’t be afraid to join in. Don’t go over the top and try to use ‘text speak’ as that won’t seem at all impressive from ‘someone of your age’, but the mere fact that you recognize your teen’s preferred means of communication may open up a route to discussion. Once the ice is broken you can suggest continuing face-to-face. If messaging on Facebook, make sure you use the ‘send a message’ function and don’t post your comments to their Wall, where all their friends can see. That would mean total embarrassment and render matters far worse even if what you’ve written is entirely innocuous! No self-respecting teen wants to be seen engaging in Facebook chat with a parent. There are probably times when your teenager comes and says something to you and either you don’t really listen or just pay ‘lip service’ to the comment. Perhaps you say you haven’t time right now. As challenging as it is, make time. It is so rare for teens to proactively approach parents, that when this step is taken it is something to be respected, whatever the subject matter; it may be a trivial issue or just general chat, but it’s opening the door for further talks when things do need to be discussed. At the end of a more ‘meaningful’ chat always ask whether there’s anything else your teenager would like to talk about and — even if they seem embarrassed — reiterate that you’re always available to talk to on any topic and that you enjoy these opportunities for frank talks. It’s very difficult to connect with a teenager when they can quickly ‘escape’ from you by going out to friends or off to their room. If you need to have talking time or just a little opportunity to be with your teenager to improve the parent-child connection, try thinking of a way to get them on their own without being overt. Many parents make the mistake of focusing too much attention on the teen by suggesting a day out together to somewhere the teenager would like to go, or a shopping trip to buy him new clothes. Unfortunately teens at that ‘awkward’ stage may just feel patronized by these generous gestures or your attention, and retort that they don’t need your help. Try reversing the situation by saying you need their help, perhaps to choose a new set of clothes, or to undertake a chore you’ve been putting off because it’s emotionally difficult for you. Or, open up to them about something you’d like an opinion on. This can work because it conveys that you see your teen as an adult with opinions that you value and an ability to make contributions to your daily life; this may be quite a new experience for both of you. If a teen is angry or upset, always take it seriously. Belittling a teen in front of other family members or the other parent, or making light of the matter by joking is a no-no and will only inflame an already difficult situation; nobody likes being ridiculed and there will be times when even our own anxieties seem silly to another adult so it’s no different with teens. If a teen is upset enough to be hurt or angry, it is a real issue for the teen at this time. Don’t take this to heart; there are also bound to be times when you don’t much like your teens’ behavior either, and how does that make you feel towards them? Do you ever feel you don’t like your teen very much even though it’s their behavior you really cannot accept? It’s understandable to say regrettable things in the heat of a moment; when angry, teens simply vocalize more those feelings that adults learn to hold back. Being a parent isn’t about always being liked. It’s about instilling the right ethics, values and behavior even if you need to sometimes be strict to achieve it, and in this way you might not be liked but you will be respected. The Teenage Brain: A Neuroscientist’s Survival Guide to Raising Adolescents and Young Adults Drawing on her research knowledge and clinical experience, internationally respected neurologist—and mother of two boys—Frances E. Jensen, M.D., offers a revolutionary look at the science of the adolescent brain, providing remarkable insights that translate into practical advice for both parents and teenagers. Parenting Teenagers: Systematic Training for Effective Parenting of Teens By Don Dinkmeyer Sr. PhD, Gary McKay PhD, Joyce L. McKay, Don Dinkmeyer Jr. Parents know the challenges of raising teenagers. This popular STEP (Systematic Training for Effective Parenting) guide is filled with easy-to-understand-and-apply skills that helps parents connect with teens and deal with their “issues.” From the STEP/teen program, with practical guidance on social pressure, dating, grades, career plans, and alcohol, tobacco, and drug abuse prevention. This handbook is an excellent choice for parents who want to improve their relationship with teens.